However, just saving and investing in the stock market is not enough. One needs to have a systematic plan in place to be able to make the most out of their investments. Investing in the right instruments is equally important. Investing our hard-earned money is a savvy method to save for large and small expenses. However, just saving and investing in the stock market is not enough. One needs to have a systematic plan in place to be able to make the most out of their investments. Investing in the right instruments is equally important. A basket of different instruments is called a portfolio. Experts suggest having a portfolio that is balanced. Put simply, a balanced portfolio is one which invests in various instruments after considering your future goals and risk appetite. Let us take a look at some aspects of an ideal investment strategy. It is important to sit with a financial planner and determine your goals, objectives, and future desires. You need to ask yourself about your future requirements and make plans for them. The financial planner will then help you make a plan. You have to analyze and find answers to complexities like acquiring assets, generating income in the future, protecting your money & assets, and a retirement plan. Once your goals and objectives are clear, your advisor will devise a strategy that will take into account your assets, earnings, and your goals. Various instruments can be looked into and analyzed for their rate of returns. A strategy can then be devised after determining how much of your money will be invested and into what. 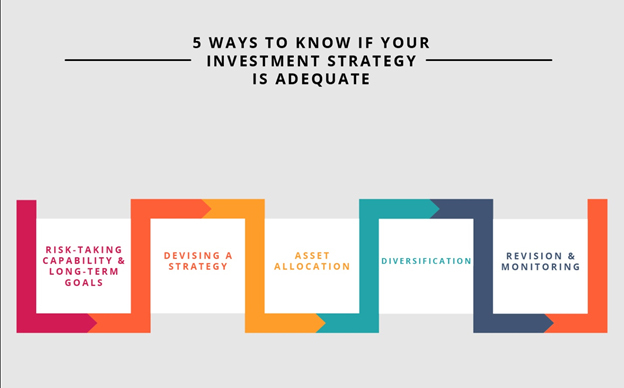 After making these calculations, you will know what to expect from your investment strategy. Once the strategy is ready, your advisor will allocate your assets to various investment instruments. Depending on the analysis of your assets and goals, the most suitable plan will be tailor-made for you. The asset allocation will consider your short-term and long-term goals and objectives. Hence, it will keep changing with time. The best way to achieve your objectives is by managing risk. Depending on the available information and analysis, your advisor will diversify your asset allocation to minimize risk and maximize returns. The future may or may not be favorable. Hence, it is important to hedge the risk into different instruments to balance your portfolio. If all your investments are in one instrument, the risk of losing all your assets in a single go is high. With diversification, you will mitigate this risk. The market is always fluctuating and is dependent on a lot of factors. Hence, it is necessary to keep an eye on the performance of your investments. You need to analyze and monitor them from time to time. If they are not giving the required results, you may consider changing your portfolio and strategy. However, you also need to remember that investments give results over a long period. If one of your investments is consistently performing poorly, you should reconsider it. Consult your advisor before reaching any decisions and take his feedback.